Bring the cream to a boil and pour over the chocolate. Mix well and set aside in a cool place for about 2 hours. Preheat your oven to 180 °C (350°F). Whisk the butter and sugar for 5 minutes then add the egg yolk. Add the flour, baking powder and hazelnuts. Mix well. Roll your dough and make small circles with a cookie cutter, having an even number then spread them on a baking sheet lined with parchment paper. Bake for 8 to 10 minutes, then remove from oven and let cool on a rack. 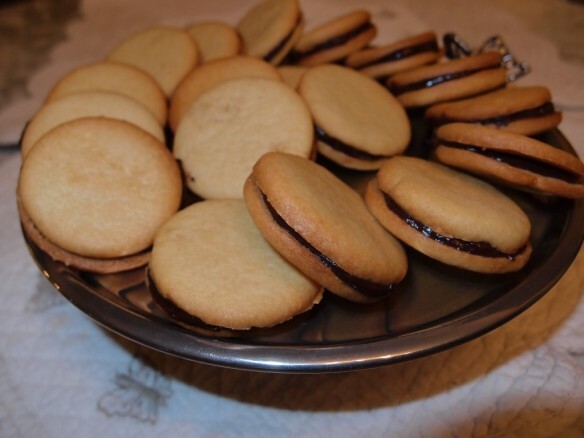 Take a small spoon of your ganache and drop it over half of your cookies and then cover with the other half to make small “sandwiches”. Enjoy it best as soon as ready !